New England’s first and CBC’s highly sought after seasonal beer, The Great Pumpkin Ale, is back in bottles and on draft! We are very proud to be brewing with locally-grown sugar pumpkins from our friends at Lazy Acres Farm in Hadley, The Farm School in Athol, and Wilson Farms in Lexington. Promoting and supporting local, organic and sustainable farming is as important to us at CBC as promoting local, seasonal beer and cuisine. This is just a part of the B.S.A. (Brewery Supported Agriculture) program that allows us to work directly with famers to grow heirloom and heritage grain varieties which are then custom malted before being crafted into CBC beer. Promoting and supporting local, organic and sustainable farming is as important to us at CBC as promoting local, seasonal beer and cuisine. Check them out at www.FarmSchool.org, www.WilsonFarm.com, and www.ValleyMalt.com. Cool! Beer brewed with pumpkins has been around since the days of colonial New England, when brewers often had to supplement the traditional barley and hops with other ingredients that were more readily available. 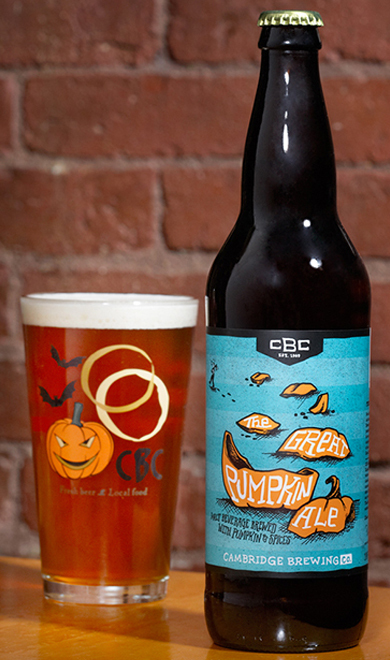 CBC, the first New England craft brewery to produce pumpkin ale, revived the style in the Boston area in 1990 and continues to brew this beer according to Phil “Brewdaddy” Bannatyne’s original recipe. Other craft breweries have followed suit since then, and pumpkin beer has developed a huge following across the country and beyond. The Great Pumpkin Ale is now available on draft and in 22oz. bottles throughout New England! CBC’s Great Pumpkin Ale is brewed with 180 pounds of fresh, locally grown, organic sugar pumpkins in each 10-barrel batch, and it has an appropriately distinct orange hue. The subtle fresh pumpkin flavor is enhanced by the addition of traditional autumn spices, and is guaranteed to please even the most finicky of harvest-time ale fanatics. CBC would like to thank all of the awesome folks who have volunteered on pumpkin chopping days, when we’ve regularly tackled 2,000 pounds of pumpkins at a time. We couldn’t do it without you guys, so thanks and CHEERS! Now raise a glass in honor of the Great Pumpkin!